Serving With Style: 6 Things I Learned Serving Steve Harvey — . 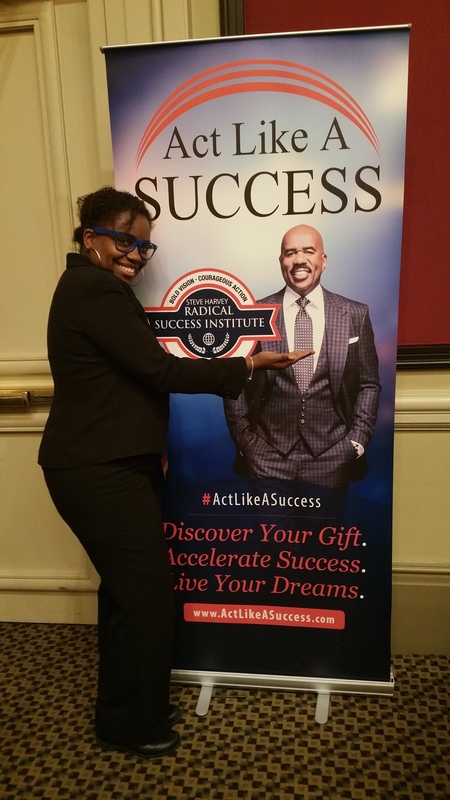 I recently had the extreme pleasure of serving at the Steve Harvey’s Act Like A Success Conference the beginning of March. The experience was almost beyond words; however, I think I found some that I want to share with you here! I learned 6 very important lessons during my time there. The energy was AMAZING!! The Speaker Line Up was PHENOMENAL! The venue was BEAUTIFUL! Though I could take all those things in and appreciate them, my view was VERY different. So what did I learn you ask? My lessons fall under 2 main themes: High Level Leader Support and Team Leader as I served in a Dual Role! 1. Build Relationships in Advance: The way that I was able to serve in the position that I did was because I had previously built a relationship with Denise. It’s important to know that just because we offer help doesn’t mean that the person must accept it. However, when you’ve taken the time to build the relationship by giving of yourself the yes is easier to receive. As Paul C. Brunson spoke of to us during his time sharing from the main stage, we give, give, and give some more. 2. What Do You Offer? : Patrice Washington, The Money Maven talked about knowing what she had to offer and operating in that as how she was able get an internship with Steve Harvey and start her mentor relationship. Often people going into situations and opportunities only thinking about what they will get out of it, but it must be a mutually beneficial exchange. Are you equipped to do the things that are going to be needed of you? You must be proactive in this role and think of the things that the leader might need before they need them. Also, be equipped with backup plans. When in a busy environment like that of a Conference there are so many moving parts so you must be prepared for what MAY happen before it DOES happen. Just remember proactive versus reactive! 3. Be a Visionary that Can Follow Someone Else’s Vision: The best leaders are terrific followers. There is an art to following while still showing leadership within your role. You must commit to the overall vision of the event and as well as the vision of the Leader you’re serving. You must also show initiative which will exude your leadership style. Doing this doesn’t eliminate your own vision, it can actually help to expand your vision as you’re exposed to new experience. For me I had the opportunity to attend the VIP Lunch with World Renowned Motivational Speaker, Lisa Nichols! While attending that lunch, while also still serving I was poured into by this phenomenal woman and expanding the vision that is within me. The dual role that I had the opportunity in was support Doreen Rainey as the Sales Team Lead. Being entrusted with this assignment was not something that I took lightly. Denise J. Hart is known for stretching those that are connected to her and she did that when she recommended me for this position as well. I had never served in that capacity at any other event and was nervous to do so at an event of this magnitude! So you KNOW that I didn’t walk away from that experience without some nuggets and a new level of wisdom! 1. Lead By Example: You must be willing to lead by example, how can you ask your team to do things that you’re not willing to do yourself? Be willing to be in the trenches with those that you are serving alongside. I knew that I was going to be in the Enrollment Center longer hours than anyone else. It was up to me set the tempo and lead the charge over the atmosphere of the room. Therefore, I did so with pride and without complaint! It was my duty and therefore my honor! If you’re not the type of person that will go the extra mile for others then there’s no reason for you to volunteer and definitely don’t be the leader of the group! 2. Realize It’s Not About You: While serving in the Enrollment Center it allowed me an up close and personal position with those attending the conference. Getting an opportunity to share and learn what these men and women want and need to move their lives to the next level was inspiring and motivating. Realizing that I was a part of something greater than just the Steve Harvey Success Institute was amazing. I was able to be a part of the lives of real people making life changing decisions. The mother that had been sitting on her dream of entrepreneurship for more than 10 years to nurture the dreams of her children making the decision to go after her own dreams now. Or the gentleman that knows he wants to take his business to the next level, but needs guidance and is investing in himself for the breakthrough he needed. Just being in the midst of that was life changing for me! 3. Manage Up: You also have to be able to manage up; THINK AHEAD! When you’re in the midst of the live event things are moving a 1000 miles per minute! Even with all the planning that is put into an event and what steps you put in place for things to run smoothly, something unexpected is bound to happen. The more you stay in the mode of thinking ahead the easier it is to maneuver the constant changes of those things happening around you. When Lisa Nichols decided that it was time for her to make the offer of the opportunity to join the Success Institute almost an hour before it was called for on the schedule we had to jump to action to accommodate the flow of people that would answer her call. Did I wait until she was done to move into action, no as soon as she starting talking me along with my teammates jumped into action mode and because we did we were able to readjust and be ready for the people when they arrived to the Enrollment Center? I’d live the experience all over again if I had the opportunity to. The lessons that I learned and the growth I experienced while being a Servant Leader was beyond anything that I expected to get from it. Stretching to fulfill a role that was new to me just reinforced my internal belief that I can accomplish anything that I set my mind and faith to. Maintaining a countenance of grace and humbleness while smiling the entire way reminds me that we can face every situation with STYLE!